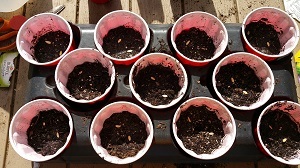 Starting your own plants from seeds is a great way to save money (quite a lot) and have the exact varieties you want, as local nurseries and big box stores often have a limited selection and few heirloom varieties of tomatoes, peppers, eggplants, squash, cucumbers, melons and other vegetables and flowers. So, you may think you have a black thumb and can't succeed, but, if you follow the simple directions below, I can assure you that you will have great results. Ypou can save at least 90% of the cost. The math is simple. I'll use 100 plants as a figure, even though you may only want a dozen,because the math is simpler. In April 2019, most stores (Home Depot, Lowe's Wal-Mart, etc.) are selling Bonnies plants for $3.68 (plus tax) , if the tax rate is 7 or 85, that means $4 per 3" or 4" peat pot. And to grow your own? Plastic 16 ounce cups (ccommonly called "Solo cups") - about $10 for 240 at BJ's warehouse. 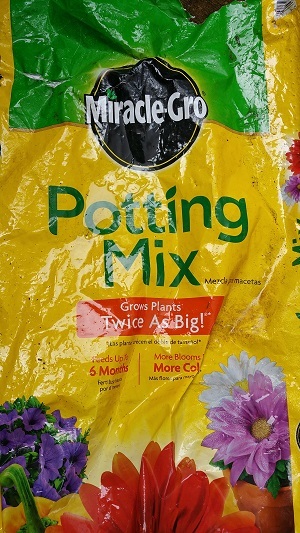 Potting soil: Miracle-Grow - 40lb bag: $10 at Costco, BJ's or Sam's Club. 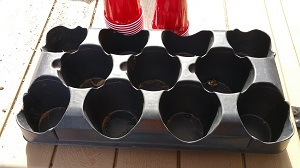 Tray to hold the cups - free, just ask for the empties at HomeDepot, Lowe's etc. Seeds - anywhere from $1.5 to $3 for a packet, for 100 plants, you'd need 2 or 3 packs, so let's say average total of $5. That''s it. 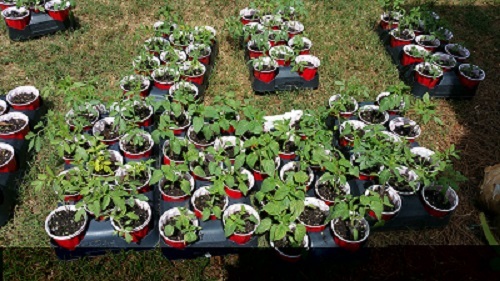 To raise 100 plants, it would cost $10 for cups, $10 for potting soil, and $5 for seeds. That is a total of $25, just 25 cents per plant. to get exactly what you want. Compared with $4 per plant at the store. Can you say "Obsecene profit ,margins"? A tray to hold the cups to prevent them from falling over. The empt plant trays at Home Depot or Lowes work great. You could also use dish pans, or even cardboard boxes from Costco. Potting soil - the 50 Qt size bag of Miracle Gro potting soil will fill 100 cups. Why buy the soil? It is sterile, so there are no weed seeds in it. It is light and designed to have the best denisty for starting seeds. It has the nutrients the seeds need to get started. Is all of that true of the soil in your back yard? Seeds. Whatever you want to grow. This method works with almost anything. I've used this to raise hundrerds of tomatoes, eggplants, canteloupes, watermelons, peppers, lettuce, kale, swiss chard, artichokes, etc. Tools: a scoop, hand trowel, etc. and a sharp knife or sizzors and a sharpie pen or other permanent marker. 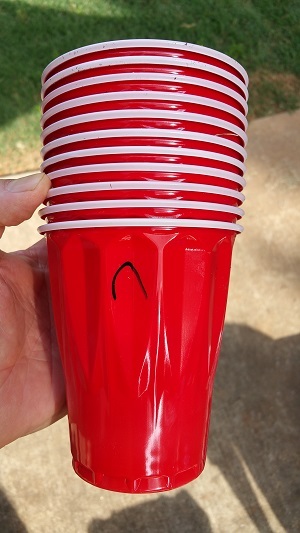 Step 2 - Label the cups. You can be as OCD or casual as you like. I just abbreviate, like C for canteloupes, BK for Black Krim tomatoes, etc. Fill each cup 2/3 full with the potting soil. Do not tamp it down. Add about 4 ounces of water to each cup. That will take sometime to fully obsorb, so although it shouldn't be soupy, it may have some free water. We add the water now to mpoisten it and it avoids uncovering the seeds if we did this after planting the seeds in the cups. 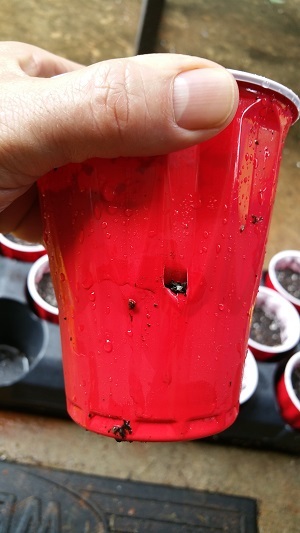 Carefully place 3 seeds in each cup, spread apart (like at the points of a triangle). Why 3 seeds? Not every seed germinates! See the table farther down this page for typic al gernmination rates, it varies from one plant to another, typically from 55% to 80%. SO, 3 seeds, pretty much ensures you will have at least one sprout. You can plant 4 or 5 seeds per cup if you have enough. And the converse is true, with larger seeds that have higher germination rates, like canteloupes, you can put only 2 seeds in each cup. 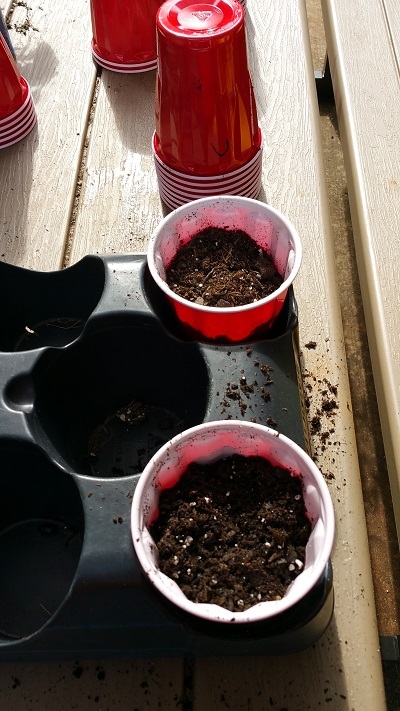 Add more potting soil to cover the seeds. 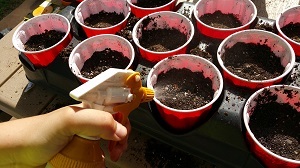 Typically, we cover seeds with enough soil to make 4 times the diameter of the seeds, but more most seeds, simply covering them with 1/2 inch of potting soil is fin e.
I set the spray onto a wide spray patter, so it won't wash away the seeds, then give each cup 10 squirts. This ensures that the soil above the seeds is moist, too. Most seeds have an optimal germination temperature. 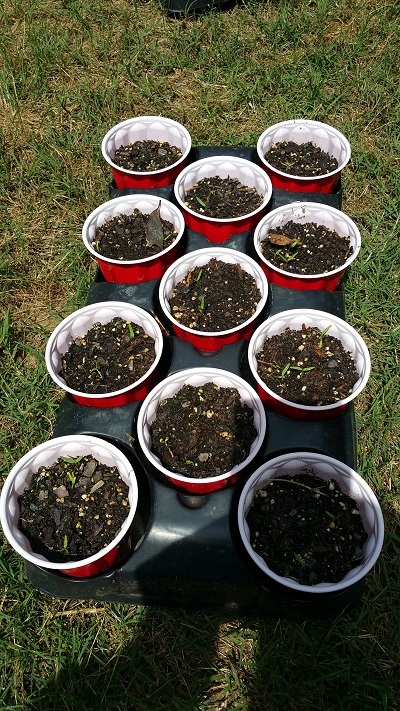 For most vegetable seeds it is between 75 F and 85 F. SO, a sunny location is fine, as long as you do not let the cups dry out. I check them every morning and every evening and use the spray bottle or gently pour in water with a cup, taking care not to uncover the seeds. How long to wait? Most seeds germinat (sproutP) within 7 to 10 days. Artichokes are a notable exception and can take 2 or 3 weeks! With a sharp knife or one side of a pair of sizzors, I punch a hole about 1/4 inch to 1/2 inch in each cup, NOT in the bottom, but rather about 1/3 up from the bottom, on the side, as shown in the photo. Why? This keeps the seeds from becoming waterlogged by overwatering (or a heavy rain), yet retains enough water to allow it to be asborbed by the entire container. I've been doing this for many years and found this placement works best. Keep the the soil moist but not soggy. Don't let them dry out. If you see mold or fungus growing on the plants or soil, you are overwatering. Keep the plants in the sun. When they reach about 3 inches tall, thin them by using your sizzors to carefully cut off the stems of all but one or 2 plants per cup. Then when they reach 4 or 5 inches tall, thin agin to 1 plant per container. Always leave the strogest looking plants. When the weather conditions in your garden are right and the plants are sturdy enough (usually 5 inches tall or higher), you are ready to plamnt them by simply gently sliding them out of the cups! That's it! Handbook for Vegetable Growers. 1960. Knott, J.E. John Wiley and Sons, Inc.